As well as becoming valuable market research for yourself, it will also help you iron out any systematic errors you have in your campaign. For example, if your Google Analytic results are not the best, you can then look to see if there are any mistakes in your PPC campaign that are causing you to have bad stats or causing you to attract the wrong types of people. You may want to also look at ‘How to Create the Perfect PPC Advert‘. 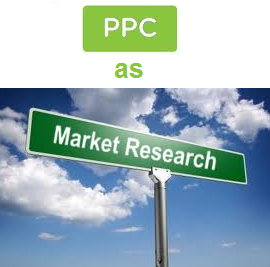 If you chose to use a PPC campaign as market research, it would be a form of primary research. This type of research has the stereotype of being expensive to carry out and time-consuming, even if the research is more specific to yourself. This is why it’s great to do market research through PPC. PPC is one of the cheapest most-efficient ways to advertise online so it’s not expensive. As well as this, a fully running PPC campaign can literally take 5 minutes to set up and get going. It’s cheap and not time-consuming. This is why PPC should be used as a market research tool more often by advertisers. Now comes the question being, ‘What type of market research should I do?’ It’s totally your choice! The aim of market research is to find something out about your market, target audience or literally anything that you didn’t know before which would benefit from knowing. For this reason, I suggest you have one last look at the different types of landing pages available for PPC campaigns. Different campaigns will suit your market research PPC campaign better than others.